Here are a couple of InuYasha desktop themes. I’ve actually had these themes for a while. I must say that I think they are pretty well done and very easy for someone to install. Anyways, I hope you enjoy these two desktop theme. I will post more later. 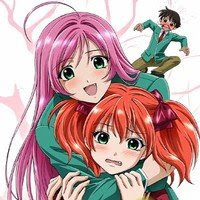 I think I maybe have forgot to post a bit earlier in the year about the announcement for the second season of Rosario + Vampire that was to be released in October. My bad for slacking off. Well anyways it is now October and just in time for the second season of Rosario + Vampire. I have been waiting for this for a while since I have finished the first season which I had much enjoyed. I think next be on my list is to check out the manga. Anyways, if you haven’t seen the first you should check it out before you watch this one. I actually haven’t had a chance to check it out, but according to Anime News Network there are already 2 episodes out. The first episode was released on the first of October. Second episode was released on the eighth of October. The third episode titled Mother + Vampire (Haha to Vampaire) will be released on the 15th of October. But I would just like to note the these releases are only in Japan. If you would like to check out a trailer for the second season here is a youtube clip.